Cisco this week hit the idea of the internet of things hard at its Cisco Live conference in Orlando. But in talking to Cisco executives, I came to realize the networking giant isn’t thinking about the internet of things (or the Internet of Everything as it calls it) as just devices and infrastructure. It’s trying to think about how to change business processes related to connected devices. And because of that, the internet of things represents a chance for Cisco to grow its services revenue from 20 percent of its revenue to 30 percent over time. 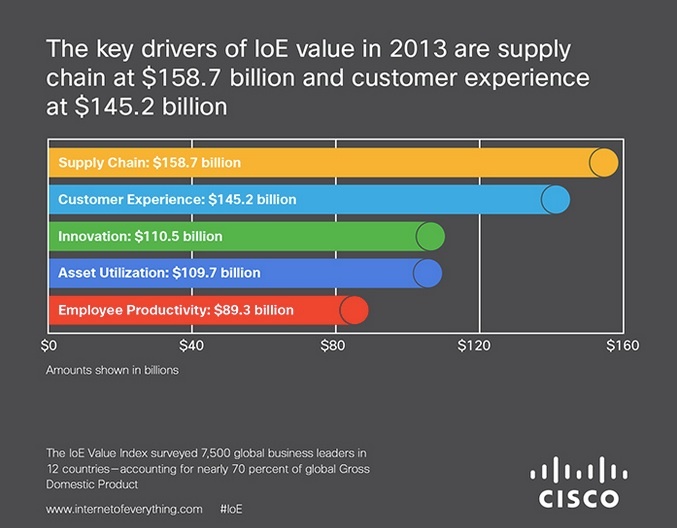 And that services vision is why Cisco persists in calling it the internet of everything. Cisco’s chief marketing office Blair Christie spoke with me this week about the company’s plans for IoT and as defended some of the eye-popping numbers it has published on how much money this trend is worth. Last week Cisco, released a research study declaring that the Internet of Everything would generate $613 billion in savings and sales in 2013 — and here I am unable to get my connected hub to talk to my ZigBee window shades! By 2023, the total savings and sales would amount to $14.4 trillion, which might be enough to buy a good-sized country that’s not in economic meltdown. But in an interview (embedded in its entirety below for those who want to take a listen) where we delved into those numbers, it appears that the Cisco vision isn’t as sensor-specific as GE’s vision is, for example. While GE is trying to corral data flowing from sensors and turn that into insights and eventual action (and releasing products to do just that), Cisco seems focused on the action. Maybe it’s better training for a Walgreens checker to upsell a customer based on her buying patterns, or helping old-line industries adapt to moving to an IP-based world, but Cisco sees an opportunity in consulting and helping companies develop business processes. And sure, it’s still going to sell a lot of gear: Christie notes that when you consider the amount of new nodes on the network — estimates of 50 billion connected devices and 5 billion additional connected people — Cisco will have the chance to sell more gear and smarter gear. But most companies are just beginning this shift to connected sensor networks and better automation based on information derived from those sensors. So while one might view those big numbers as an exciting indicator for the internet of things, Cisco’s right to call it the internet of everything. In truth, those data points represent the value a connected society is already bringing to business, as opposed to the future of sensor-rich manufacturing floors and data-derived automation. To hear more, about Cisco’s point of view, check out the audio below. Update: This story was updated on July 2 to correct the timeline for Cisco’s $14.4 trillion estimate. It believes that by 2023 the internet of things will generate $14.4 trillion in cost savings and revenue, not by 2020. Fully agree that internet things, including social media, are not just as infrastructures but also chances to grow business effectively. A report from Uniqloud says, by now, Social Analytics and Social CRM have already accounted for 30% share in CRM application market. in murcia the local university of murcia is great at IOT..they have a whole department that works on smart hospitals schools office blndgs and homes.its amazinf that here in murcia in spain they are so interested in this..think it relates to the agriculture here. Murcia is the worlds 1 provider of lemons and in agriculture all is IOT. irrigation picking location of pickers vehicles shipping orders..Maybe some of this knowhow crept into the more general fiels of IOT.. They also purchased Joulex out of Atlanta, an energy management for large buildings last month. The deal isn’t finalized, but this should be a new addition on their internet of things offering.